I found this piece of gold jewelry with a dragon in Main St. Flushing, N.Y. I was going to shoot it from outside the shop when I thought I might ask the proprietor if it would be alright to photograph it from inside where there would be no glare from the window. They buzzed me into the shop and four ladies in blue uniforms came forward and took the necklace out of the window and set it up for me to photograph. I took a couple of shots and they were very pleased as was I. As you might notice the dragon is on the right side while a rooster phoenix is on the left side of the necklace. The heart in the center is highly decorated as is the rest of the necklace. I wanted to ask questions about it but I didn't want to overstay my welcome. It looks like there is a sunflower over the heart. Who would wear such a necklace? Certainly not me. Maybe a princess, a very rich princess of a very important Chinese dynasty. The dragon enjoys a very high reputation in Chinese culture. It is the token of authority, dignity, honor, success, luck, and capacity. In ancient China, a dragon was thought to speed across the sky with divine power. Emperors entitled themselves exclusively as 'dragon'; their thrones were called 'dragon thrones', their clothes 'dragon gowns'. The phoenix has always been the symbol of rebirth or new beginnings. The Dragon and the Rooster phoenix are probably good matches. 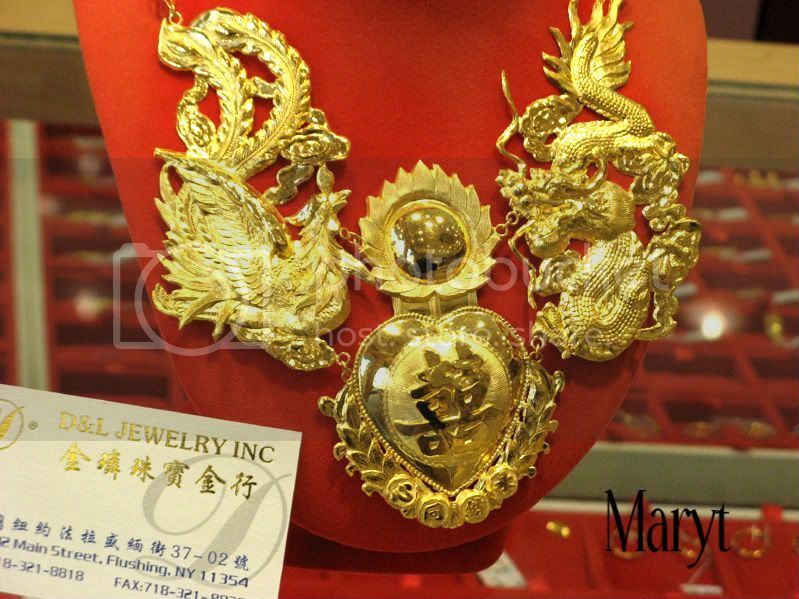 So it makes me think that a very rich Chinese lover would give his lady this necklace as an engagement or wedding gift. UPDATE: The information graciously given by Chan Chee Khiong in the comments has made me correct my observations a bit. Quoting Chan: "It's a necklace for wedding. The word on the 'heart' is usually used only for wedding which are two 'happiness' placed side by side.I think the dragon represents the groom and the phoenix, the bride. The pair are legendary creatures traditionally used to symbolise the masculine and the feminine and are usually shown together." Also Elaine Ling had information for me. I should have asked people in the know before I wrote my commentary! Duh! What an amazing amount of detail. Can't imagine have the patience to do such intricate work. Nice... Haven't see a necklace like like this. It's a necklace for wedding. The word on the 'heart' is usually used only for wedding which are two 'happiness' placed side by side. I think the dragon represents the groom abd the phoenix, the bride. The pair are legendary creatures traditionally used to symbolise the masculine and the feminine and are usually shown together. I wondered if maybe your "rooster" wasn't really a Phoenix. I see much more knowledgeable commenters than I, have already shared their expertise. This looks like a major chuck of gold and the workmanship is incredible. I wholly understand the security, and I marvel that they let you in just to photograph. Amazing! You were so confident in asking to photograph it - great job! I give you the award for going the greatest distance so to speak in capturing a dragon! Absolutely gorgeous! I love dragons and have quite a collection, but don't have this one. You really became a dragon ... specialist ! Interesting about the rooster, I think I am more rooster than dragon, fortunately ! although my husband might think the other way around ! I still had no opportunity to go on dragon hunting, lol ! Wow, you sure found one expensive and awesome dragon, didn't you. Incredible!! Perhaps the bride of a very wealthy Chinese emperor or something like that wore it on her wedding day. One born in the year of the dragon, the other in the year of the rooster, the heart symbolizing their love and the sunflower their joy. Or something like that, hahaha. That's a beautiful piece of gold ornament! Great for my niece's wedding dowry! Wow....oh wow. Four guards surrounding you to photograph the gold dragon. Amazing! You go girl!!!! You are coming up with some great dragons. When I was looking through Chinese collections I inherited, I noticed a lot of roosters but none on the same pieces with the dragons. That's cool how this has both. Oh my, it must have been heavy, too. I could not wear it either. Yes, I was going to say I think it must have been a necklace signifying a bond between someone born in the year of the Rooster and one born a Dragon. It's absolutely gorgeous. I'm a dragon, and one of my dear friends is a rooster. We get along perfectly. It's wonderful how the store employees helped you get such a wonderful shot of the necklace for your blog. Only now I realise there're typos on my comment. Silly me. You're really having great success in your Dragon Hunt, Mary! A truly amazing piece of jewelry as well as a lovely window on the traditions of another culture. If you care to stop by, I completed the Big Read meme. I had similar luck with a jewelry shop... but I didn't get nearly so nice a photo - despite our efforts! I reckon you'll see tomorrow! Great work, lovely photograph and what a spirit of co-operation from the shop assistants. Love the book meme too. Many on the list that are my all-time favourites.